We live in a day and age where we are constantly bombarded with new media just about every second. It’s incredibly hard to make a lasting impression on audiences nowadays with products that aren’t either sequels or reboots. Originality is something that has fallen on deaf ears or has gone to the independent communities. Yet, Jordan Peele has managed to not only give us a film that is lasting but also layered with brilliant themes of race, violence and more. Starting his career from comedy, Peele made a lasting impression with his turn as a writer-director of 2017’s Get Out. Even going as far as becoming the academy award winner for Best Original Screenplay for the film. The nightmare master is back with US. US tells the story of a family, led by Lupita Nyong’O & Winston Duke, who are terrorized by their doppelgangers bent on creating a revolution. Us is a layered, complex and beautiful horror film with depth, humor and genuine scares. Honestly even writing this review (and doing our podcast episode), it’s hard to decide where to start with the praise for this cinematic achievement. Nyong’O & Duke both starred opposite one another in last year’s Black Panther ­­– though as an ensemble film it’s hard to truly stand out. This film allows both actors to showcase their amazing range. It’s almost seriously impossible to really say who steals the show more. They both turn in incredible performances. Nyong’O is beautifully portrays a woman with a mysterious past. She is riddled with PTSD. She’s quiet, yet fierce. She’s shy, yet strong. Nyong’O doesn’t just stop with her role as Adelaide, wife and mother of two – she also stars as the ruthless doppelganger, Red. Red allows for Nyong’O to truly demonstrate how terrifying and broken the actress can be. It’s haunting in every sense of the word to truly experience her screen time. Yet, you can’t turn away. Then, in the same breath, you have Winston Duke. Duke is still young in his career. Aside from a few television bits, Panther is really the biggest thing that he has done to date. Now with Us, Duke gets to showcase a more comedic side but also his charm. Duke’s Gabe is serves in a lot of ways as the film’s comedic relief. Even from the first time he graces the screen – he’s cracking dad jokes. Establishing very quickly that he is a character you can truly and genuinely love. Past just a few laughs though, Duke shows a level of empathy and strength that you can’t help but love. Equally as electrifying to Nyong’O, Duke solidifies himself as an actor to watch for. If you loved him as M’Baku in Panther & Avengers: Infinity War – this is a film that proves he can go above and beyond and blend to any genre of the medium. It’s not just what’s going on in front of the camera which makes Us stand out within the genre – it’s also writer-director, Jordan Peele. Peele crafts a film that is layered with allegories on a multitude of topics. Get Out was a film that served to speak out on race. With Us, Peele manages to speak out on a multitude of topics ranging from government secrets, conspiracies, the treatment of veterans, the elderly, healthcare and more. This film is a layered masterpiece that embraces all of these subjects but presents them with humor and genuine scares. With only his second film into writing and directing, Peele is a man to continue to watch out for. Overall, Us¸ is a masterpiece of the craft. Layered brilliantly with subtext on a multitude of different social issues – Us presents a narrative that feels like a breath of fresh air. Equipped with humor, scares and a well-paced plot, this film is sure to stand out strongly within the horror genre. Speaking of the horror genre. The only downside to this film is the embrace of the genre’s tropes; which creates a layer of predictability. 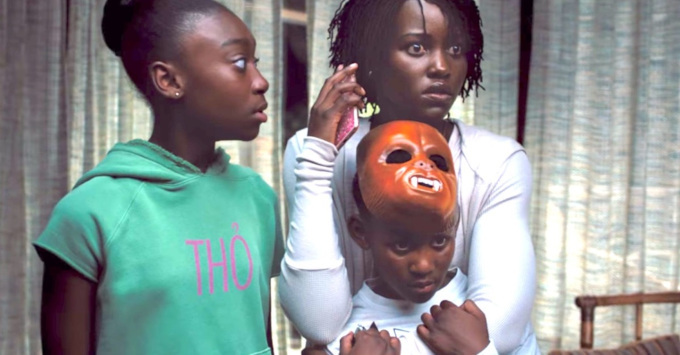 It’s easily forgiven though when you have a strong voice like Jordan Peele behind the vision of the film & strong performances from Winston Duke & Lupita Nyong’O in front of the camera. Music by Logan McElroy and Shawn Davis. The X-Files are property of Fox. We do not own nor claim any rights. The Flash & Man of Steel are property of Warner Brothers & DC Comics. We do not own nor claim any rights. Super Smash Bros is property of Nintendo. We do not own nor claim any rights. US is property of Universal Pictures. We do not nor claim any rights.